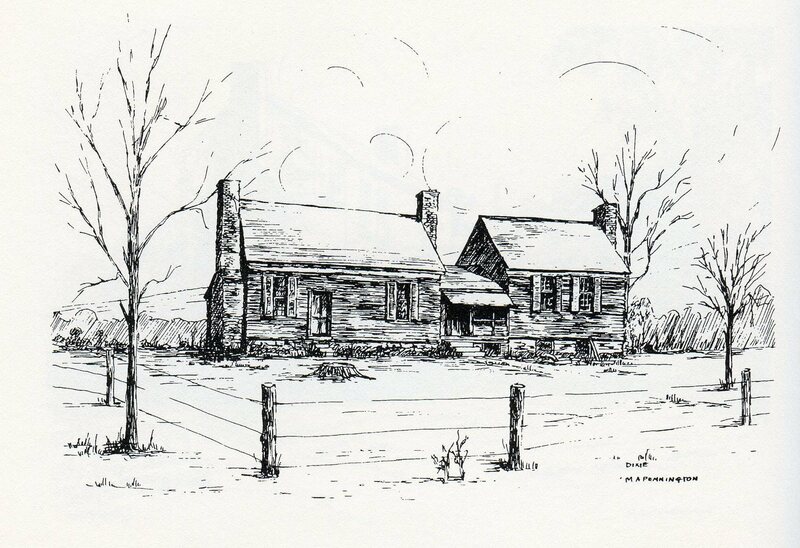 Buckingham Houses: Dixie Hill | slate river ramblings . . . . In 1937, Rosa G. Williams described “Dixie Hill” (a.k.a. Dixie) for the Virginia Historical Inventory. Once owned by Jack Jones, it was purchased in 1872 by Rev. John Spencer, who is buried on the place. The old house is in very good condition. There are nine rooms, and it is thought that six were built originally, and that three were added later. There is a little enclosed porch or hallway between these rooms. There are four large closets; some have said that one of the largest closets was used by Mr. Jones, as a wine closet, as he was said to have been a very heavy drinker. There are three very large fireplaces. The rooms are all plastered, and have wainscoting about twenty two inches wide. The house was constructed of heart pine, and put together with wooden pegs and shop-made nails. The roof was originally shingled, and the shingles were put on with wooden pegs. In 1892 the shingles were taken off, and slate put on. That is the only repair work that has been done to this house since it has been in the Spencer Family. The old kitchen was torn down about 1920. It is said that the fireplace in the old kitchen was long enough to use a six foot log.